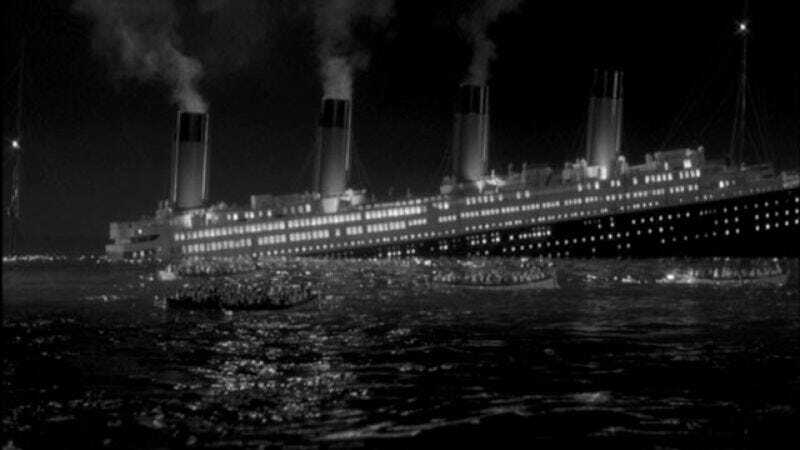 James Cameron may have nabbed Oscar gold for his CG-enhanced recreation of the famed ship’s sinking, but even without that smash hit’s fictionalized upstairs-downstairs romance, A Night To Remember remains the most harrowing retelling of the RMS Titanic’s historic 1912 end. Nominally focused on Second Officer Charles Lightoller (Kenneth More), but in fact taking a wide-ranging view of the ship’s ill-fated maiden voyage, director Roy Ward Baker’s film—adapted from Walter Lord’s 1955 book of the same name—swiftly sets up its scenario, in which the Titanic is doomed after receiving only the first of a series of dire ice warnings from nearby vessels. Those missed missives result in the Titanic striking an iceberg, leaving it only a few hours to corral as many passengers as possible into lifeboats—a task made all the more difficult, and nightmarish, by the fact that those escape crafts can house barely half of the Titanic’s 2,200-plus travelers. A Night To Remember takes a sweeping, somber perspective on the action, detailing the arduous efforts of Lightoller and his men to usher women and children off the Titanic—a mission complicated by the panic and selfishness gripping passengers. The film also shrewdly segues between first class and the decks below, where the poor are trapped so that the rich and powerful can abandon ship. From individual heroism and venality to class-based wickedness and nobility, Baker captures an overarching sense of the many forces at play as the Titanic takes on water, all while conveying the slow build-up of widespread terror gripping those forced to face the reality of their inescapable situation. It’s a classic, both piercing in its unvarnished look at man’s best and worst impulses, and heartbreaking in the way it encapsulates its tragedy in incisive, unforgettable sights: a dining room serving cart rolling across a tilted floor; orchestra musicians continuing to play as death draws near; and the horrified eyes of those fortunate few lifeboat passengers watching as the ship—and their fathers, husbands, and sons still aboard it—descends to a watery grave. Availability: A Night To Remember is available on Blu-ray and DVD from Netflix and possibly your local video store/library. It can also be rented or purchased digitally from Amazon.